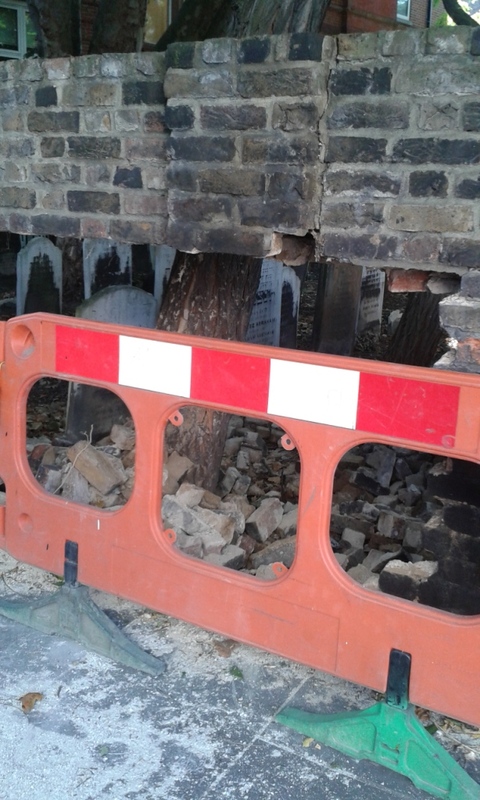 Last week, on Friday, I was on the 211 bus heading home with a bag of shopping when I saw that there had been some damage to a brick wall on the corner of the Fulham Road and Old Church Street. A whole section of the wall had been knocked inwards possibly as a result of some kind of impact. I thought I should take some photographs but when I went out on Sunday the area was surrounded by workmen and equipment, with a temporary set of traffic lights. On my way in this morning I took a few pictures, as the breach in the wall was still there. Not only is there a hole, but behind it a pile of bricks. 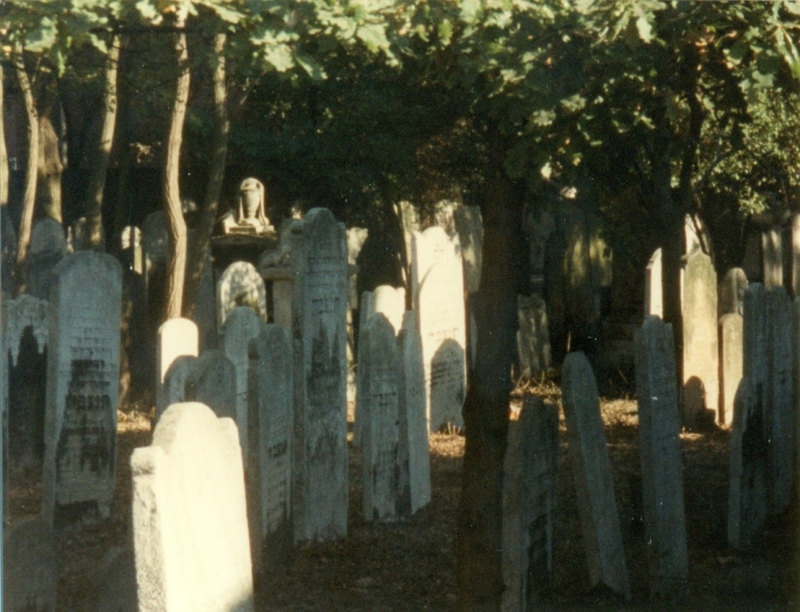 Beyond that you can see the gravestones themselves. It’s not the first time this wall has been disturbed. Back in 1989 I was also there with a camera when the whole wall was partially demolished and there was the opportunity to take some pictures of an obscure corner of Chelsea. In normal circumstances you only get the chance to see the area behind the wall if you’re sitting on a passing bus. 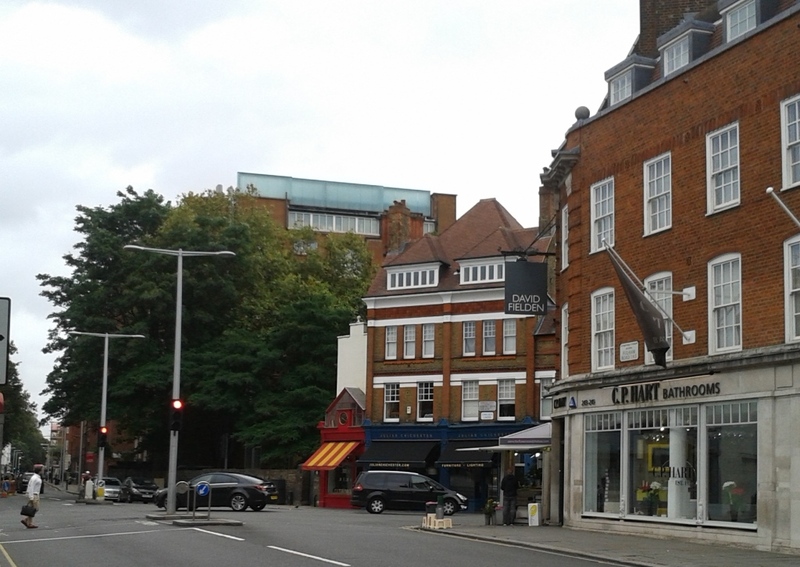 This corner, between the Institute of Cancer Research and a short row of shops devoted to antiquarian books and interior design, is the location of Chelsea’s Jewish Cemetery. The wall, as you can see, was then short enough to look over. 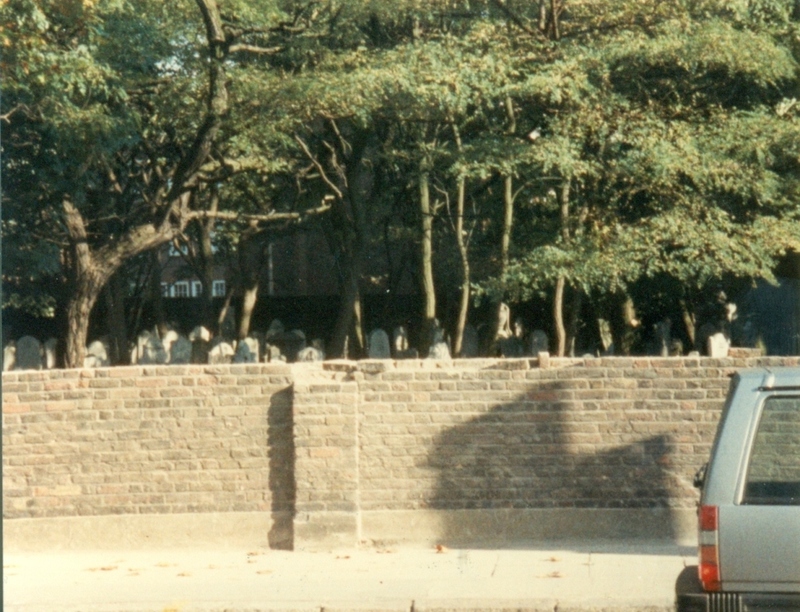 The original wall was tall enough to completely conceal the cemetery. It was a bright day for October. The pictures were taken with an Olympus pocket (film) camera so they look a little grainy. But you can make out the Hebrew inscriptions. 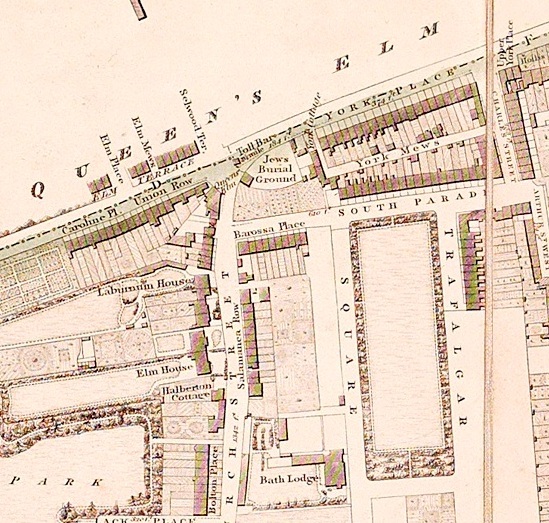 The cemetery, or burial ground appears on Thompson’s famous Chelsea map of 1836. 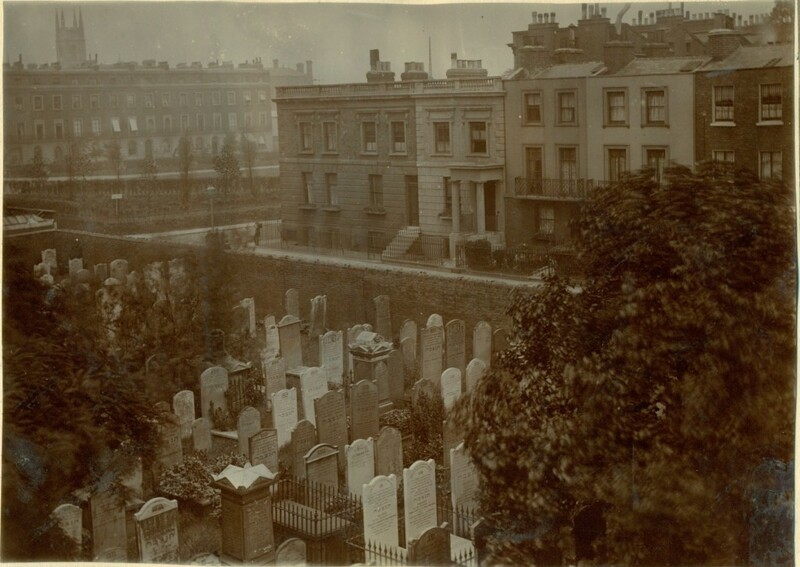 George Bryan, in his 1869 book “Chelsea in the olden and present times” tells us the burial ground was “erected in 1816 by the individuals whose names are inscribed on the wall of the entrance building” (visible on the map). 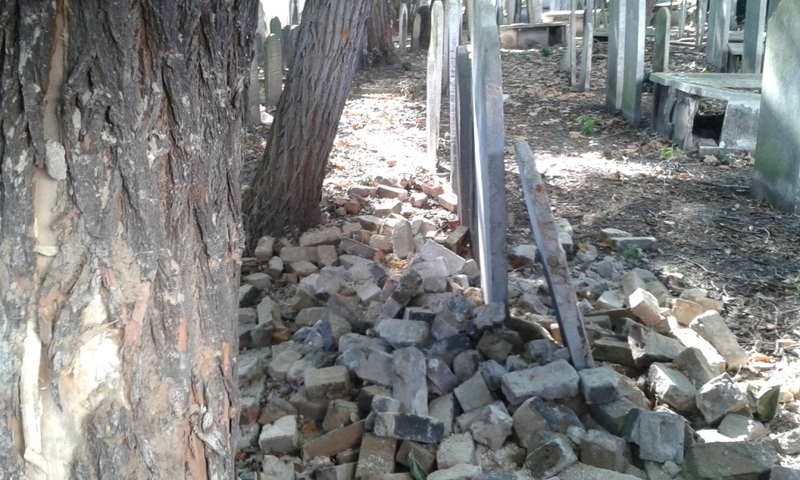 Hugh Meller, in the third edition of his London Cemeteries (an invaluable book for London historians) which has details of 14 Jewish cemeteries in London says: “The impression given by this tiny cemetery is more typical of Prague than London.”. I can see his point. 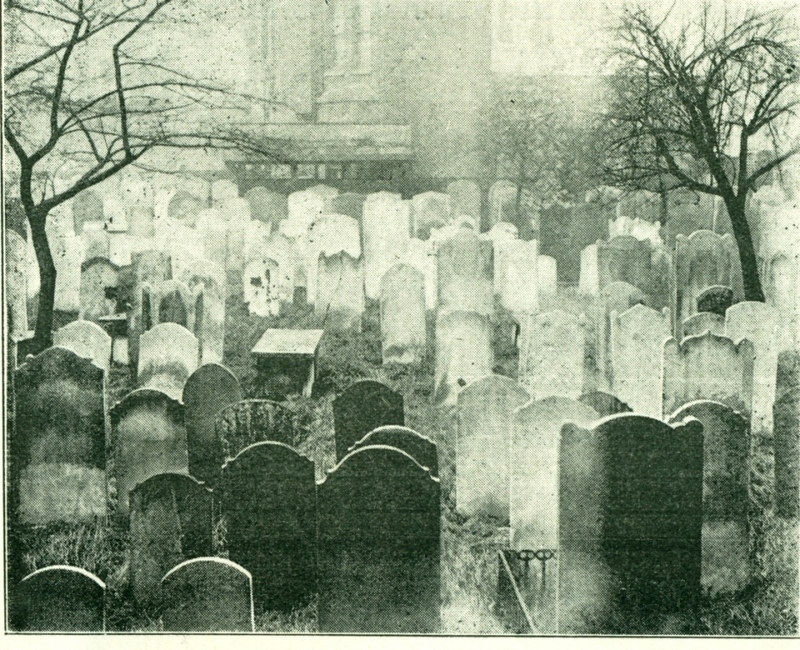 The 300 gravestones are in a comparatively small area, almost hermetically sealed behind a brick wall and “a rusty iron gate“. 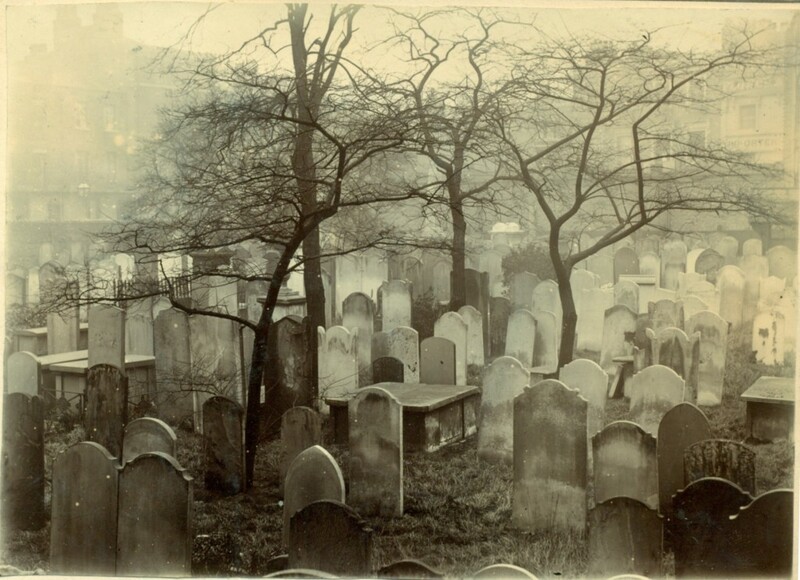 I imagine the burial ground fitting into a Bruno Schulz story (or a film by the Quay Brothers for that matter) especially as modern Prague is often used as a location for Victorian London in recent films and TV dramas. These pictures, from one of our scrapbooks are also dated 1896. In this one, possibly taken from one of the shops you can see South Parade and beyond it Trafalgar Square, and the tower of St Luke’s Church. 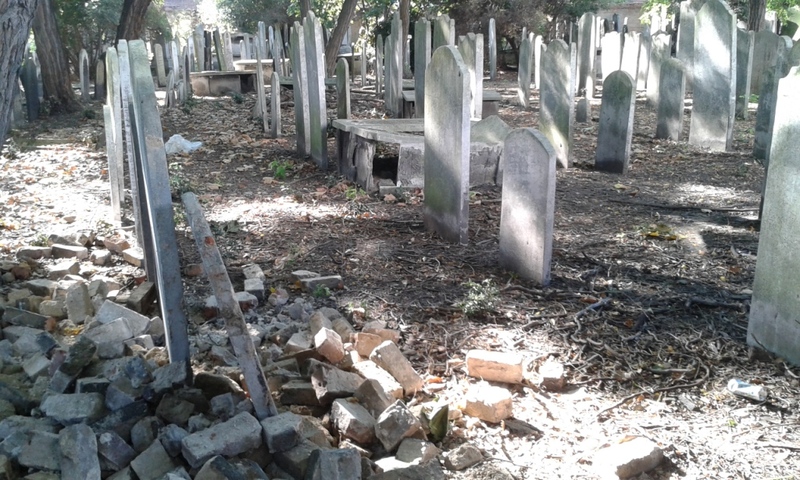 In the 1970s the cemetery was under the threat of redevelopment and there was a plan reported in local newspapers in 1974 to have the ground deconsecrated, and any surviving remains removed to Israel. This never occurred. 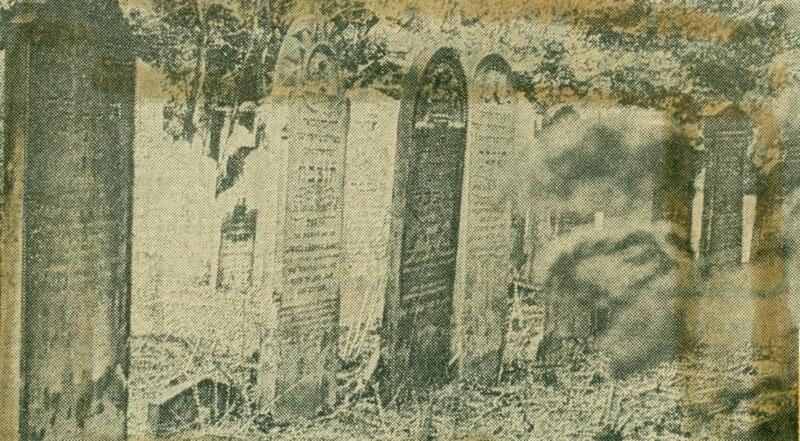 I was told that a benefactor paid for some restoration work to keep the cemetery secure. It remained an obscure corner of Chelsea, safe behind its walls. A place of absolute stillness beside a busy road, its continued existence a source of satisfaction for those who like the quiet places of the city. 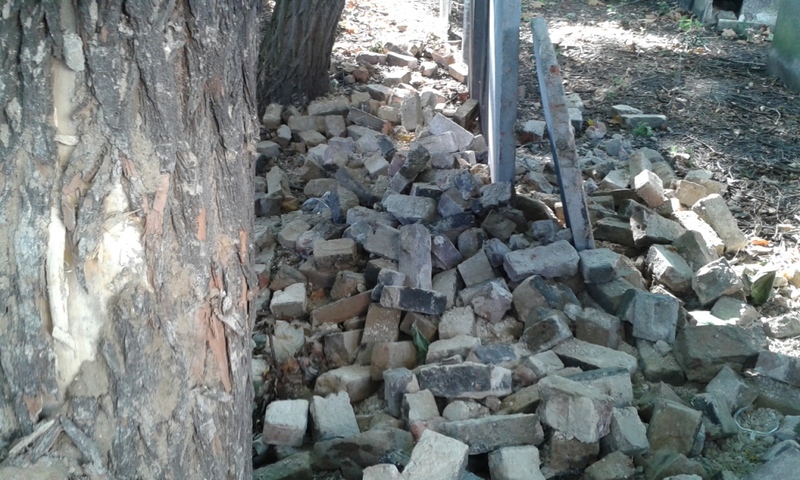 The hole in the wall is now boarded up, which you can almost see in this picture but the main point of it is to show that even with the wall breached the cemetery is well hidden by the abundant trees. Hugh Thomson steps in to help again. The picture is from Highways and Byways in Kent (1907). Isabel will be back soon. It was fortunate this subject presented itself to me out of nowhere. I’ve noticed that I’ve written posts about almost every point of my journey to work, with very few gaps and this is a further addition to the psycho-geographical trail. I’ll work on those gaps in the future. 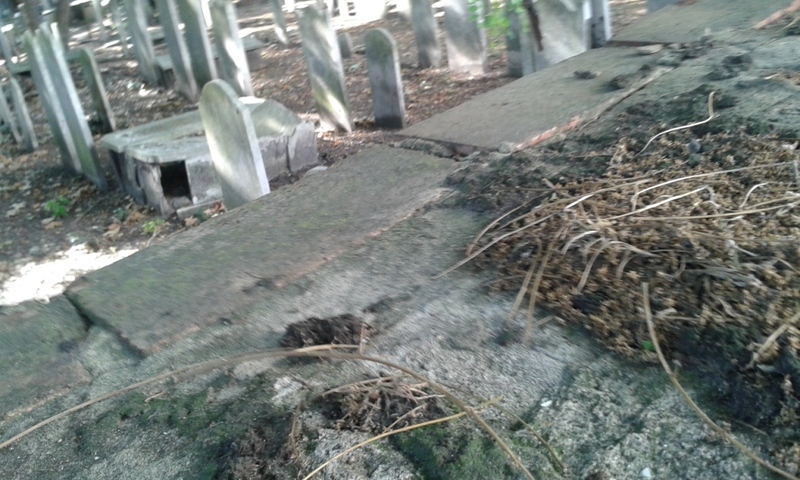 This entry was posted on Thursday, August 18th, 2016 at 7:28 am	and tagged with Fulham Road, Jewish Cemetery and posted in 19th Century, 20th Century, 21st Century, Chelsea. You can follow any responses to this entry through the RSS 2.0 feed. Wow, what a fantastic find which I never new existed. Thank you for yet another gem. London had several Trafalgar Squares, and a few Bond Streets. The Post Office rationalised street names in the 1930s which is when Chelsea’s Trafalgar Square became Chelsea Square.The name Trafalgar Chambers for a building on South Parade survived. Had to drag my drunken dad out of the Queens’s Elm on several occasions! I often, as you mentioned, looked down over the wall into the Cemetery from the top deck of the 14 bus, returning back down the Fulham road from South Ken, or further afield. As a child I wondered why it was so tiny in comparison to the mighty Brompton Cemetery. It was also a useful reminder to turn right on the way to the Children’s Library in Manresa road (1960s and very early 70s); it’s now ‘Gems Hampshire School’ apparently! Years later, when we were finally leaving Fulham Road, I found an unreturned Children’s Library Book; expecting a huge fine I entered fearing the worst. They passed it off very kindly saying that they were only grateful to see an old friend; I don’t know whether they were referring to me or the book! i lived nearby in Evelyn Gardens in the 50s and early 60s for around 15 years and never new the cemetery existed. In the early 60s i used to deliver newspapers to the flats in Trafalgar Chambers, in the early dark winter mornings the stairs were unlit and it used to freak me out climbing to the top flats, i used to take a deep breath and deliver all my papers before running out of the building with my heart pounding in my chest, it was a scary building, had I known it backed onto a cemetery I would have left them at the bottom door. 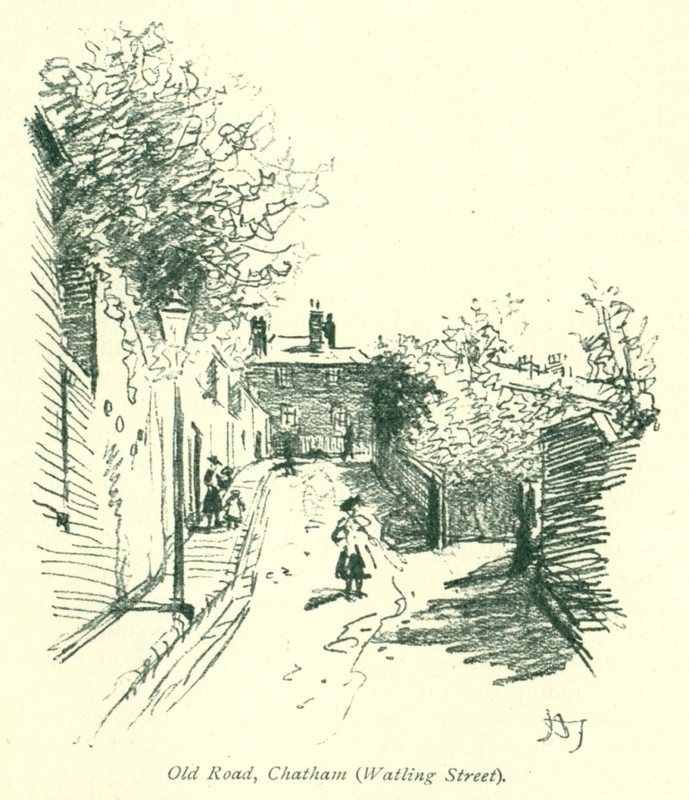 Another memory as a child was a lane that is now gone and was opposite the Queens Elm pub called Elm Mews. it was an unmade dusty lane with wooden buildings which I think may have been a Blacksmiths, it always struck me as being like somwhere out in the countryside but in reality you were only a few hundred yards from the busy Fulham Road. I grew up in Trafalgar Chambers in the top flat with no running hot water and an outside loo, right next to the cemetery and above the coffin shop and garage for the undertakers on the ground and first floors and right next to the fire station. When I was a child it was a working fire station and I remember our view from the bedroom window which looked right over the cemetery. Though I lived there you’re right! It was always REALLY scary. My parents moved into this flat just after the war, brought up four children there and didn’t move out until 2007 when we finally managed to get them to move to a comfortable flat in Eastbourne. I hated that building and was always afraid, especially as you had to leave the flat to use the loo. Dear Chris, Elm mews (now Lecky Street) comprised of five cottages interspersed with stables and workshops and a carpenters shop belonging to Christopher Surrey. It’s this workshop I believe you thought was a blacksmiths, although it is possible in light of the stables that in the 1800’s there might have been a small blacksmiths there. Also York mews ran along the back of Trafalgar Chambers, the Fire Station and the Brompton Hospital Nurses home (all in South Parade) and housed the entrance for the undertakers (whose name escapes me)and who had a shop opposite the mews in Fulham Road and whose coffin workshop ran along the first floor of Trafalgar Chambers, their garages for the hearses being housed underneath. That mews was also quite scary and very much a place that time had forgotten! York Mews is now Dudmaston Mews. I didnt know about the Jewish Cemetery,undertakers or the coffin workshop next to Trafalgar Chambers when I delivered my newspapers to those flats at the top of the building. Had I known the papers would have been left at the bottom. Now I can understand why I was so scared walking up those dark stairs every morning, there was obviously a hint of death floating around that building. I was born in the fire station next door, my Dad was a fireman,. My Mum said the cemetery was in view from our flat which was on the top floor. The Fire station is now an Eye hospital. It’s not an eye hospital; it’s the Royal Brompton Hospital centre for Sleep :0) I’m not sure how your mum would have been able to see the cemetery as Trafalgar Chambers was between the cemetery and the fire station, was as tall and ran along the entire length of the wall. There was a small piece of the wall which backed onto the mews at the back of the fire station but as the fire station was the other side of the mews, no windows overlooked it. If you google Trafalgar Chambers, South Parade you can see a fairly recent photo which proves my point. The top floor windows along wall of Trafalgar Chambers were our bedrooms. I stand corrected, sleep hospital it is. I cant ask my mum as she is dead, It could well have been my Dad who said it was visible, he after all spent a lot of time on the roof in the smoke tower. Whatever the case no one cares if it was visible or not. We moved away when I was 2 and I really dont care either. That’s fabulous ! I was too young to remember when the smoke tower was actually used but my mum said it was manned even at night. Do you know that was true? And the cemetery would definitely have been visible over our flat roof from the smoke tower. Very interesting. I had heard about this cemetery, but until I discovered your blog I had never seen any pictures of it. What is now the book shop on Queens Elm Parade used to be a greengrocers. This shop used to have a door out the back which opened right out onto the cemetery itself and the greengrocer used to keep his potatoes out there. Does anyone know how to arrange a visit, please? We’re looking into that. More soon. I’d really like to visit if it is at all possible. Hello, I am coming to London very soon and would love to be able to visit. How do you get to do this? Who do you arrange through? I have done some genealogical research using information from burials here. Thank you all for the historic facts and interesting personal anecdotes, which I have found very interesting to read. I actually stayed at the Centre for Sleep at the end of May 2018, which is housed in the old Fire Station, but also comprises (at least) the ground floor of old Trafalgar Chambers. Having checked the street view in Google Maps, I can confirm that I entered the black door of the Fire Station, and the individual overnight rooms are through a short walkway to the left. So imagine my surprise, settling in for the night, when I opened the ground floor window and saw the backs of all those grave stones! It is somewhat ironic that this is the view from the Centre for Sleep. Having dwelled on this much neglected and apparently forgotten resting place, I was delighted to find this article. If you are interested in the cemetery/its history check out this website. 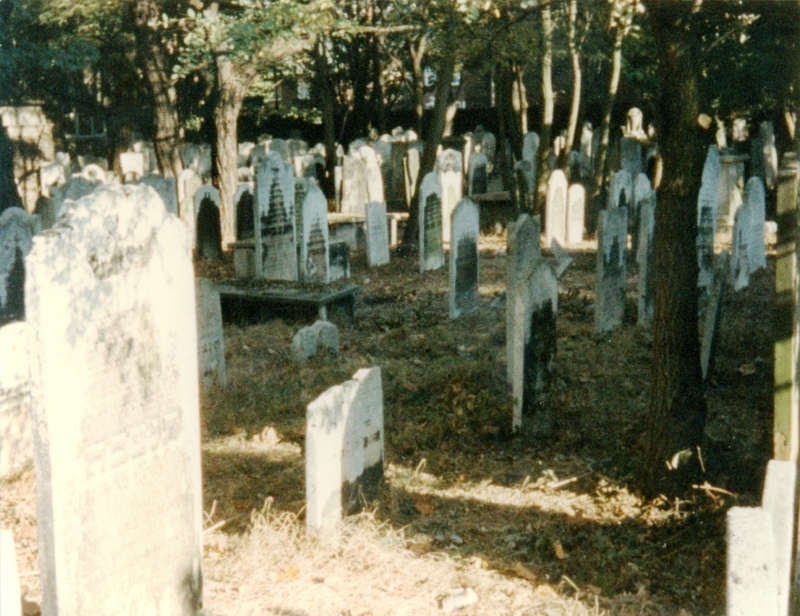 It opened in 1761 and closed in 1885 with the occasional burial right up until 1910 and it is recognised as being the oldest surviving Ashkenazi cemetery. I haven’t been back to Chelsea Square since my parents left in 2007 but I’ve loved this site and reading about an area I once knew so well. As children we used to dare each other to climb over the gate by the grocers just to frighten ourselves but now I think of it with nothing but fondness. 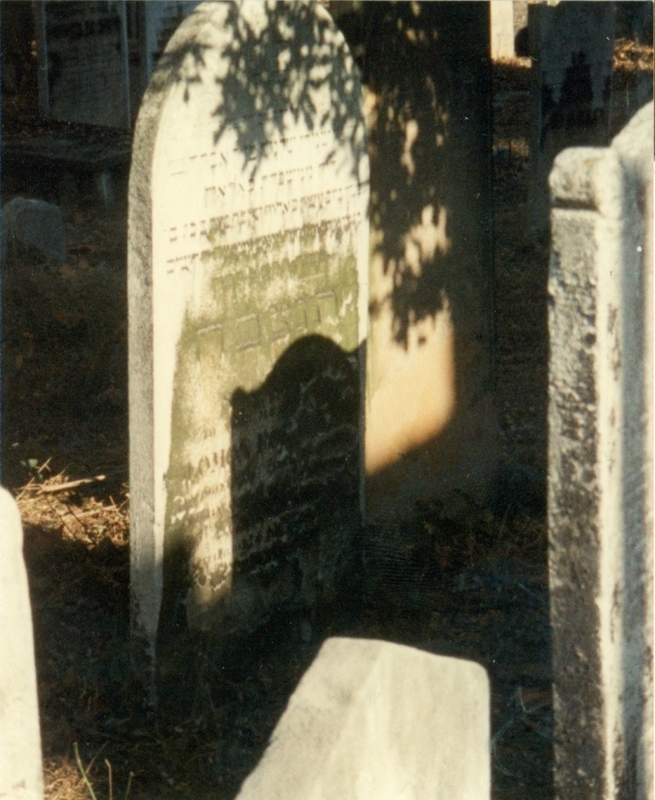 Strangely, many years later my eldest sister ended up marrying Richard Hopkins; the widower of Adel Hopkins ne Rootstein whose estate on her death bought and saved the cemetery, giving it to the Western Synagogue company in perpetuity. I hope some of you take the trouble to visit it. That is fascinating about Adel Rootstein, thank you.